Innotech was well represented at the latest ARBS International Air-conditioning, Refrigeration and Building Services trade exhibition held in Melbourne 17-19 May 2016. 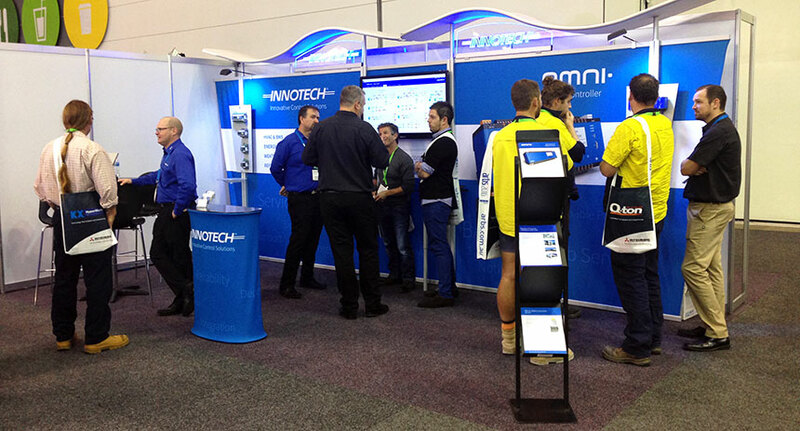 This year Innotech was equipped with a brand new stand to complement the new Innotech Omni platform. Our location at the show certainly received a high volume of traffic, and the Innotech products displayed ensured we caught our visitor's attention. The full range of production-ready Omni controllers were on display, as well as our existing Maxim series products, which is of course is well known to most. The new Omni platform generated much interest, with many eager clients asking when it might be available. "Omni has many industry-first technologies and a complete new software platform as well. We are working hard to make sure that Omni meets the high standards of quality and reliability that our customers have come to expect from Innotech, so we won't go to market until we are satisfied Omni meets our, and your, expectations." Other items on display included the Omni programming suite of software, "Focus" (built in-house by using the Bluestone Framework from Grafica Software ), the Omni on-board web-server, newly enhanced Magellan BEMS 3-D graphical interface and the Maxim suite of software which is used by Training Organisations nationally and internationally. The stand was capably manned by members from Innotech HQ (Including attendance from Innotech Owner/Directors Stephen and Virginia Miranda), Innotech Sydney and Cortrols (our Melbourne Distributor). Other Innotech representatives in attendance included Bonlec (Cairns, Townsville and Mackay), Innotech Tasmania, Cowan Controls (Northern Victoria) and Eurotec NZ. It's always great to catch up with our long term Innotech family, in particular Mr Martin Boniface from Bonlec Controls who we haven't seen for some time. We thank everyone who attended from our group and those who worked tirelessly on the stand. We believe this was one of the most successful ARBS shows we have been involved in for some time. From the ARBS organisers' point of view, ARBS 2016 was record breaking with 323 exhibitors (a new high, up from 274 in 2014) and close to 9000 visitors (an increase of 13.6% on 2014). Many of the seminars were also well attended, with some being at full capacity. The show in 2018 moves back to Sydney in the new redeveloped Exhibition Centre. ARBS 2016 was definitely a successful show for Innotech, with much excitement for the up and coming Omni release. To stay in touch regarding the Omni BEMS Controller release register here.